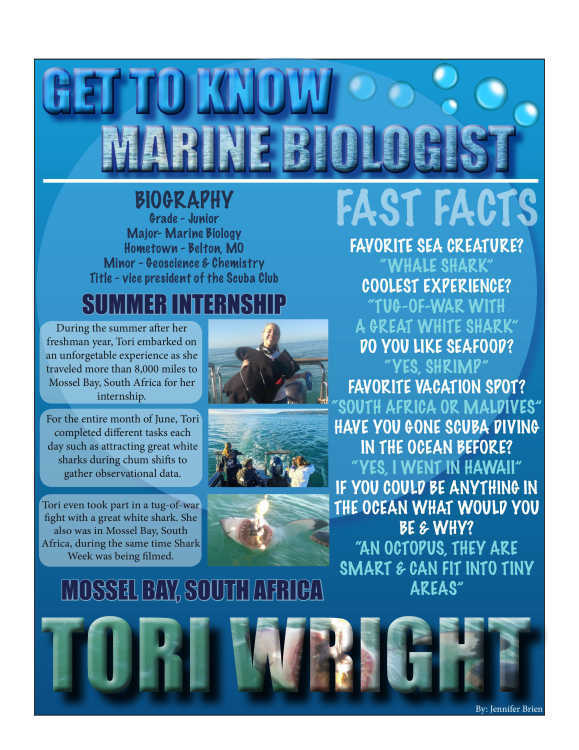 From traveling to Mossel Bay, South Africa, for a summer internship to focusing her studies on marine biology, junior Tori Wright is seeking a career path where the oceans are her office. As a Belton, Missouri, native Wright is pursuing a marine biology major that combines her two passions: animals and oceans. “I always knew that I wanted to work with animals of some kind growing up, and just connected really well with them, but I didn’t really know which area I wanted to go with it,” Wright said. 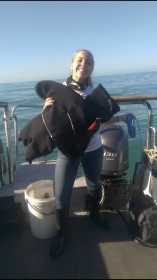 Photo of Tori on one of the many boat shifts she took part in during the month of June. Wright spent many summers in San Diego, visiting family and growing a strong passion for oceans that helped her make a decision when it came time to choose a major. “I just fell in love with the ocean from going out there every year,” Wright said. Knowing that she wanted to study the concepts of the ocean, the question then came down to where she wanted to study. Tori enjoying the many opportunities she was able to take part in during her month-long internship. After narrowing her radar to Missouri, which kept her in-state, her next decision was choosing the best fit between Southeast Missouri State and Northwest Missouri State - the only schools in Missouri that offer a marine biology program. Professor of biology Michael Taylor, who has a background in marine biology, was asked to help develop the program that became official in 2009. Ten years later, it is still growing in popularity. The program is set up to ensure students are meeting the requirements of classes and gaining experience, a necessity needed to graduate. With that in mind, SEMO has partnered with the Gulf Coast Research Laboratory located at the University of Southern Mississippi in Ocean Springs, Mississippi. The lab focuses on varying fields of marine biology while offering hands-on learning. Students enrolled at SEMO must take a minimum of three credits from GCRL or a comparable institution. For Wright, she chose to fulfill her requirement by landing an opportunity more than 8,000 miles away with Oceans Research in South Africa. Joining 23 other interns, Wright noted she was the youngest in the group. A month-long internship focusing on observational research of sharks meant the possibility of close encounters, one that did not come until Wright’s final shift. Despite the yanking and thrashing of the shark being just two feet below her, she stayed calm and eventually won the battle that felt much longer than it turned out to be. “Then it let go and I just started crying because of my adrenaline, I watched the video later on and it happened about half a second,” Wright said. Doing the right job at the right moment gave her an up-close personal experience with an animal she hopes to one day be working with. She also plans on working to inform people about the oceans. Mossel Bay was the place to be in the month of June as Shark Week joined the waters to film an episode for Discovery Channel featuring Michael Phelps, marking another highlight to Wright’s nearly perfect internship. Wright is also pursuing a double minor in chemistry and geoscience. Taking these science courses allows her to gain a broad understanding of the ocean from varying perspectives. Now miles away from any nearby ocean, Wright is staying busy as the vice president of the Scuba Club now offered at SEMO, all while keeping a close eye on her future plans. “I got [scuba] certified last year because I want to work in the ocean, so I think that’s a really helpful tool to have,” Wright said. A scuba certification only expands the resume Wright is putting together as she looks closer toward graduate school. “I will have to get graduate experience somewhere. It’s a highly competitive field, so grad school will help when getting an entry-level job,” Wright said. Until then, Wright is focusing on her studies and hoping one day she can return back to the ocean and pursue her passion at a professional level. “It’s nice to be on ocean-front property but you don’t have to,” Taylor said. Through her journey at Southeast, Wright is proving the possibility of studying this major in the Midwest.